Weyerbacher does not pour large sums of money into their graphic design department. Their logo was probably made with Microsoft Paint by the owner's son during study hall. However, they seem to invest their money into something worthwhile- creating new beers. Weyerbacher's Fourteen is responsible for our deeper dive into the wheatwine style and their latest imperial stout, Tiny, was nothing short of amazing. For all these reasons amongst others made us anticipate the arrival of their next anniversary brew, Fifteen. Weyerbacher's Fifteen pours jet black with a light carmel head. An earth-like tinge hits the nose as you go in for that initial whiff. Hints of nuts with chicory as the "smoked" flavor lets it's presence be known as it flows over the taste buds. This beer is well bodied and coats the tongue with a silky yet earthy taste as it lingers until the next sip. We let this beer warm up to near room temperature and it's body went from a Baconator with a Frosty to just a Wendy's Double. Weyerbacher knows how to celebrate their birthday. 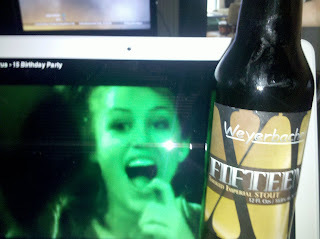 Twelve, Fourteen and Fifteen (Thirteen wasn't sold in Ohio) are all fine examples of what an anniversary beer should be. This is something a stout fan should pick up since this is a perfect example of an imperial smoked stout. At 10.8% ABV, this will get you where you should be for a birthday- intoxicated.